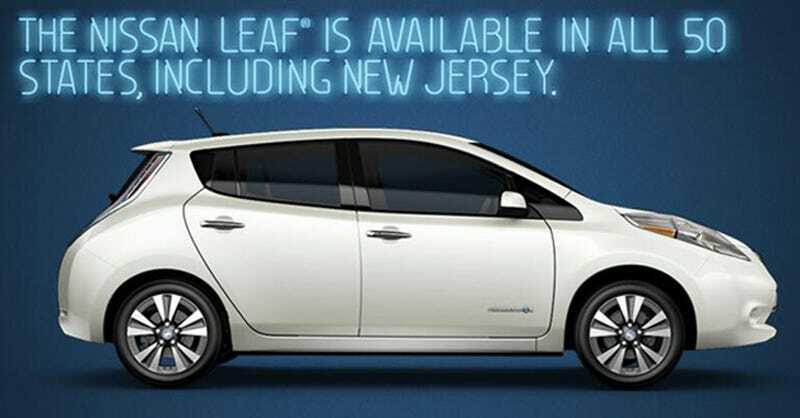 Tesla Motors suffered a crushing defeat in New Jersey last week that resulted in a ban on direct sales of their cars starting in April, but Nissan's Twitter account was quick to let you know you can still buy a Leaf in the Garden State. Neener-neener, Tesla! Autoblog Green reports that the picture you see above was tweeted by the otherwise phenomenally boring Nissan Leaf Twitter account after Tesla lost their fight with dealers in New Jersey. Well played, Nissan! That was a nice zinger. Rob Robinson, senior specialist of social communications for Nissan, told AutoblogGreen that the Leaf Twitter account is run by an agency, and that the tweet in question, "Was not a tweet that was reviewed or approved by Nissan. We saw it and asked them to take it down." As for the reasoning, Robinson said that, "We thought it was a discussion we didn't need to be weighing in on." It's a shame they took it down, because the tweet was clever and (mostly) harmless. I highly doubt anyone at Tesla took great offense to this, either. Can't we all just have a little fun at each other's expense sometimes?